My Garments of Praise: Let's Discuss // Is the Thrift Shopping Trend Over? Let's Discuss // Is the Thrift Shopping Trend Over? Until about a year ago, thrifting had a strong influence on fashion, retail and the overall U.S. economy. Now, we hardly hear about it anymore. 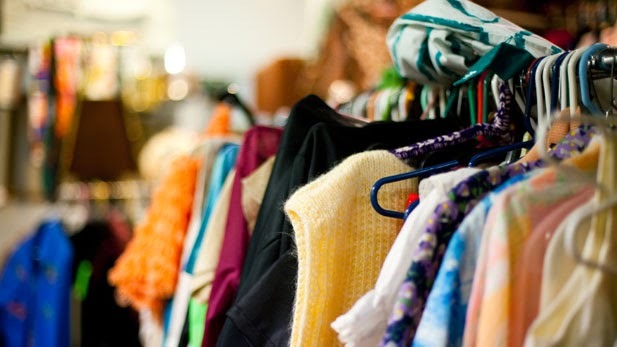 During the economic downturn, shoppers turned to thrift stores to meet their basic need for clothing while sticking to a tight budget. In the process, many quickly realized that vintage gems and even the latest fashions could be found in the most unexpected places. The secret got out, and thrifting turned into the trendy way to shop. A handful of people thought it necessary to set themselves apart and make it known that thrifting for them was a lifestyle and something they had been doing for years before it became popular. Others unashamedly admitted that they would have never thrifted before their income dwindled and they found out that thrift stores sold like-new and even brand new designer clothing for less than a fraction of the original retail price. If this was the case, why do we hardly, if ever, hear about it anymore? 1) When something becomes popular, the novelty wears off not too long after. The more and more people "scoring gems" at thrift stores, the less gems there are to score. Plus, the exclusivity of knowing the best places and the best times of the year/week/day to thrift disappears along with the gems after every style blogger spilled the beans. 2) Retailers started to compete. Understanding that their target demographics were mostly broke young people who couldn't land jobs, trendy retail stores started having more sales and implementing creative ways to save. The shoppers who weren't loyal to thrifting decided, why go through the inconvenience of rummaging through the weird smelling, disorganized racks at thrift stores to save money on that one item that took three hours to find when you can buy a brand new item from half a season ago for just a couple of dollars more. 3) The economy improved... slightly. This was partially due to retailers finding ways to get their shoppers to shop again, which led to more jobs, which led to consumers making more money, which led to a "flight to new" mentality again for young shoppers. The economy still has a long way to go though, so while stores like Forever 21 and H&M rejoice, high-end department store sales are still not what they used to be. While only a few loyal thrifters remaining, that second-hand way of shopping is certainly not getting the attention it used to. Was it a trend? Is it over? If the answers are yes, then congrats to the committed thrift shoppers and quality vintage lovers. You'll be able to find your gems again. Note: Quite often, readers engage more in discussion topics on Instagram, so feel free to check out people's thoughts there. Very interesting article. Love it. I was one of those kids who resided outta state and when i heard these bloggers speaking of thrift this and thrift that and all these boasy garment they got at thrift stores.. Made me eager to jump on a plane to experience this. But at the same time who wouldnt when they brag about getting 20-30 items for 100 bucks or less. I think it was a trend. Thrifters realy got there time to shine .. Ha. Its not over though... I think its jus not the hottest topic anymore as it was yesteryear.